Time to sew? The image to the right might help with the placement of emblems and patches. This uniform will be used for Webelos Scouts and will work for the first and second year Webelos. 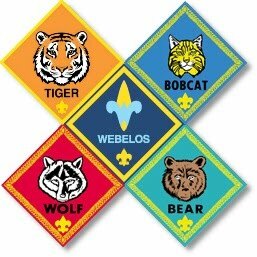 The Hat, Shirt, Neckerchief, Slide, (Pants or Shorts are up to the den), Council Patch, Pack Numbers (see Below), Flag, and Den Number (Optional) make a good start to your scout's uniform. The Pack Leaders may have Council Patches and other standard patches in stock. Check with the Cubmaster or Committee Chair for availability. We occasionally special order the Red Patch with the Pack Numbers (to the left) so you don't have to sew three number patches separately. Check with the Cubmaster or Committee Chair for availability. Before most pack meetings we normally make a trip to the Scout Store. You might contact the Advancement Chair if you need a patch or two and we can pick them up for you at cost. Some of the smaller badges and patches are awarded at Pack Meetings as your scout earns them. So there are some awards and patches the Scout Store will not sell to parents. There is no cost for earned badges and medals. But you will need to sew them to the uniform as they are earned.